Hedge funds are known to underperform the bull markets but that’s not because they are terrible at stock picking. Hedge funds underperform because their net exposure in only 40-70% and they charge exorbitant fees. No one knows what the future holds and how market participants will react to the bountiful news that floods in each day. However, hedge funds’ consensus picks on average deliver market beating returns. For example in the first 2.5 months of this year the Standard and Poor’s 500 Index returned approximately 13.1% (including dividend payments). Conversely, hedge funds’ top 15 large-cap stock picks generated a return of 19.7% during the same 2.5-month period, with 93% of these stock picks outperforming the broader market benchmark. Interestingly, an average long/short hedge fund returned only 5% due to the hedges they implemented and the large fees they charged. If you pay attention to the actual hedge fund returns (5%) versus the returns of their long stock picks, you might believe that it is a waste of time to analyze hedge funds’ purchases. We know better. That’s why we scrutinize hedge fund sentiment before we invest in a stock like The TJX Companies, Inc. (NYSE:TJX). The TJX Companies, Inc. (NYSE:TJX) was in 58 hedge funds’ portfolios at the end of the fourth quarter of 2018. TJX investors should be aware of an increase in support from the world’s most elite money managers in recent months. 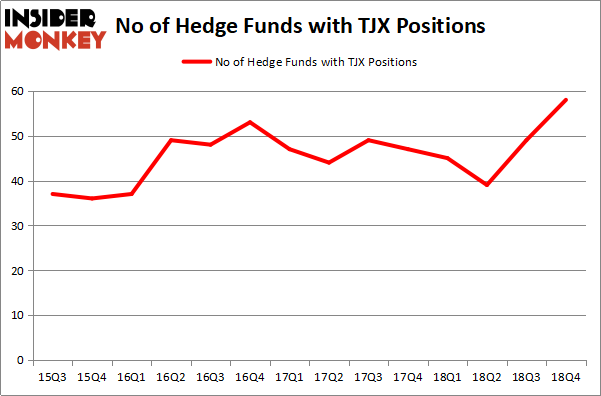 There were 49 hedge funds in our database with TJX positions at the end of the previous quarter. 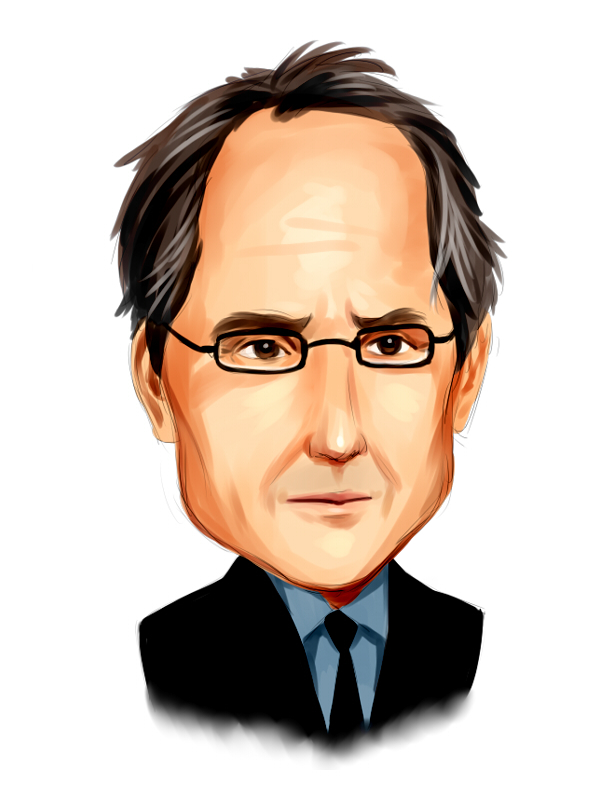 Our calculations also showed that TJX isn’t among the 30 most popular stocks among hedge funds. We’re going to take a glance at the fresh hedge fund action regarding The TJX Companies, Inc. (NYSE:TJX). What does the smart money think about The TJX Companies, Inc. (NYSE:TJX)? Heading into the first quarter of 2019, a total of 58 of the hedge funds tracked by Insider Monkey were bullish on this stock, a change of 18% from the second quarter of 2018. Below, you can check out the change in hedge fund sentiment towards TJX over the last 14 quarters. So, let’s find out which hedge funds were among the top holders of the stock and which hedge funds were making big moves. Among these funds, Arrowstreet Capital held the most valuable stake in The TJX Companies, Inc. (NYSE:TJX), which was worth $642.2 million at the end of the third quarter. On the second spot was AQR Capital Management which amassed $407.9 million worth of shares. Moreover, Diamond Hill Capital, Two Sigma Advisors, and D E Shaw were also bullish on The TJX Companies, Inc. (NYSE:TJX), allocating a large percentage of their portfolios to this stock. As one would reasonably expect, specific money managers have jumped into The TJX Companies, Inc. (NYSE:TJX) headfirst. Junto Capital Management, managed by James Parsons, created the biggest position in The TJX Companies, Inc. (NYSE:TJX). Junto Capital Management had $68.9 million invested in the company at the end of the quarter. Michael Kharitonov and Jon David McAuliffe’s Voleon Capital also made a $31.8 million investment in the stock during the quarter. The other funds with new positions in the stock are Paul Marshall and Ian Wace’s Marshall Wace LLP, Alexander Mitchell’s Scopus Asset Management, and John Tompkins’s Tyvor Capital. Let’s now review hedge fund activity in other stocks – not necessarily in the same industry as The TJX Companies, Inc. (NYSE:TJX) but similarly valued. These stocks are Intuitive Surgical, Inc. (NASDAQ:ISRG), Canadian National Railway Company (NYSE:CNI), T-Mobile US, Inc. (NASDAQ:TMUS), and PNC Financial Services Group Inc. (NYSE:PNC). This group of stocks’ market values match TJX’s market value. As you can see these stocks had an average of 46.5 hedge funds with bullish positions and the average amount invested in these stocks was $2290 million. That figure was $3062 million in TJX’s case. T-Mobile US, Inc. (NASDAQ:TMUS) is the most popular stock in this table. On the other hand Canadian National Railway Company (NYSE:CNI) is the least popular one with only 24 bullish hedge fund positions. The TJX Companies, Inc. (NYSE:TJX) is not the most popular stock in this group but hedge fund interest is still above average. This is a slightly positive signal but we’d rather spend our time researching stocks that hedge funds are piling on. Our calculations showed that top 15 most popular stocks among hedge funds returned 19.7% through March 15th and outperformed the S&P 500 ETF (SPY) by 6.6 percentage points. Hedge funds were also right about betting on LMT, though not to the same extent, as the stock returned 16.2% and outperformed the market as well.